AWE - Active Worlds Europe, is keen on Quests. Every year they organise several questsd in the 3D worlds of Activeworlds Europe, and every time in completely different surroundings. This time, everyone will be looking for Easter eggs in different worlds, and gain points that may entitle you to prizes. This Quest has something special in addition to the other worlds… There are 12 mazes you can only get through if you are good at maths! Every room contains Easter eggs with points, but you can only visit the next room if you got an A for the exercise in the previous room! It could be a good exercise to test your maths knowledge. (and Dutch, as all exercises are in Dutch). Many of us know only the online demo world of Active Worlds that's been sitting around for ages. You can register here for a tourist account and walk around for a few minutes. Citizenship comes at a price, but as Activeworlds Europe celebrates its 5th birthday this year you get a free membership (2 weeks). You can extend this citizenship by converting the points you've earned during the Quest. If you're good, you can earn yourself a free year of citizenship or even a dedicated private 3D world. What's the difference between a citizen and a tourist in Active Worlds? Tourist. You can chat with other people, play games, win prizes and even build your own home in one of the public worlds. However, your options and choices of Avatars are limited. avatars, permanent builds and features like contact lists, instant messaging and private conversations in most worlds. It also allows you to open your own Web World. Citizenship costs €6.50 per month or €65 per year. Is this interesting for you English folks? Maybe not. Maybe you're not interested in doing math-quizzes at all. But with a two week free citizenship, it gives you the chance to explore more worlds and options than the online free demo and explore a bit and see what AW is capable of. 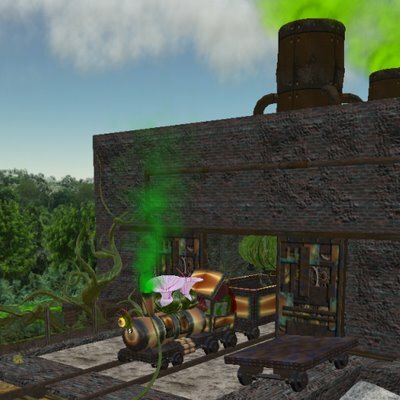 From the makers of the Greenies Home comes a second immersive experience, the Toxic Gardens. Today I received a preview of the new sim produced by another team of excellent builders, among which Botany Black. "Toxic waters: The toxic waters, upon touching your skin, begin to cause a numbness that covers your entire body. As it spreads, you find it hard to stay upright, and eventually fall to the ground, and then into sleep..."
"To boldly go where no man has gone before..." Well thousands have visited the Galaxy sim now. 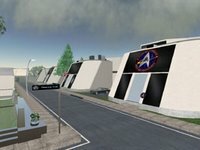 Galaxy is the base of Test station 3, run by the Federation, a circular space station hovering at an altitude of about 250 m. The nearby sim Aeon houses the offices of Starfleet Command and a 3rd sim, Constellation, is under construction. Many Star Trek fans come here to do role playing. The Galaxy sims is the largest Star Trek cluster on the grid (sofar), but there are other Trekkies inworld. Nemesis Content Creation enjoys creative collaborations with companies and individuals which enhance Second Life. In the Netherlands they're probably best known for their work on the Amsterdam Arena. They've done a few other things though. One of these fine things is the Pot Healers mystery. The Pot Healers mystery has been available as a free-to-play immersive questing game for over a year now. Originally due to close after a few weeks, the players then, and many players since, donated to keep the game open and alive. 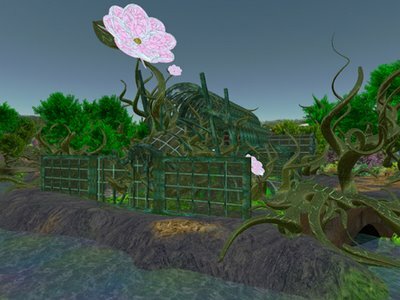 In early 2006, they developed a sim in six weeks to provide a demonstration of the possibilities of the Second Life platform. Some of the innovations included a "follower pet" by Oclee Hornet which triggered explanations in chat of the surroundings, a trampoline game and bash-the-mole game. The Manoa Development is a project by Winfinity and Centric (not the IT corp, but a media agency). The current Manoa setup and announcement provide an interesting story to be set up. Winfinity regrets to announce that the Manoa Development Project has overrun its budget and must be closed. The development ship El Dorado has been recalled by the board, and matter transportation from Manoa to Earth has been disabled. We regret any inconvenience this may cause, and apologize for the short notice. As the Manoa Project’s data logging has produced conflicting reports of late, we are seeking independent investigation into the causes of the cost overruns. The board has allocated a bonus of L$100,000 for the best data explaining what occurred during the final months of the Manoa Project. All independent investigators are invited to visit Manoa and report their findings. Please note that the data you provide could lead to the re-opening of the Manoa Project and possible career advancement. IMPORTANT: WINFINITY IS NOT RESPONSIBLE FOR THE SAFETY OR WELL-BEING OF ANY INVESTIGATOR, INDEPENDENT OR ALLIED WITH WINFINITY. Winfinity wishes to close this investigation in a timely manner, so please submit any and all data prior to June 1 of the current year. You may access the Winfinity Matter Transportation Grid to Manoa here if you are Metahuman Version 1.5 or above.